Conoce las medidas de conservación del parque. Se incluye acceso a las exhibiciones de reptiles, patios de pantanos y fauna exótica del parque. El parque recreativo Sawgrass está a solo 25 minutos en coche del centro de Fort Lauderdale, en el corazón de los Everglades de Florida. 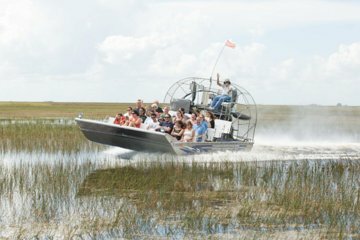 Comience con un recorrido en bote de 30 minutos por los Everglades y recorra el agua con pasto a velocidades de hasta 40 millas por hora (64 kph) mientras aprende sobre el ecosistema subtropical del área con el experimentado capitán. Busque una variedad de vida silvestre, como caimanes, peces, tortugas y aves zancudas. La Exhibición de Reptiles presenta docenas de especies nativas y exóticas a Florida, desde tortugas, iguanas y serpientes hasta Caníbal, un caimán intimidante de 1,000 libras (454 kg). Los manejadores del parque siempre están felices de hablar sobre cómo viven y sobreviven estos animales en la naturaleza. En la exhibición de Glades, aprenda sobre la historia del área y sus esfuerzos de conservación en una presentación de video. Luego revise las tortugas de espuela africanas, que varían en tamaño desde 20 a más de 100 libras (9 a más de 45 kg) cada una, más las raras tortugas de Gopher (que fueron rescatadas de un sitio de construcción), iguanas y coloridos pavos reales. Y finalmente, en la exhibición Exotic Wildlife, eche un vistazo a los gatos salvajes del parque: panteras, leopardos, gatos monteses, caracales y más.  We enjoyed this experience very much, great value and purchasing tickets and checking in went very smoothly. We loved the Everglades, the air boat and the Reptile Exhibit afterwards. We saw some turtles and we did see one small alligator in the wild but it was mostly submerged. Captain Jim was very entertaining and informative. To other travelers we are not familiar with the area at all so we came prepared with a printed Google map as well as Navigation in our rental car. Both fell short of getting us to the address we were given for Sawgrass Recreational Park. We just had to go a little further is all. You can see it in the satellite view on Google maps if you are heading North on 27 you need to go North of 75 a little bit. Google Maps calls it Everglades Rec Park and you can see the docks and air boats in satellite view. We definitely recommend this adventure and Viator. Would like to have rated this tour but unable to do so because the journey to the site from our hotel in Fort Lauderdale would have cost twice as much as the trip we booked. 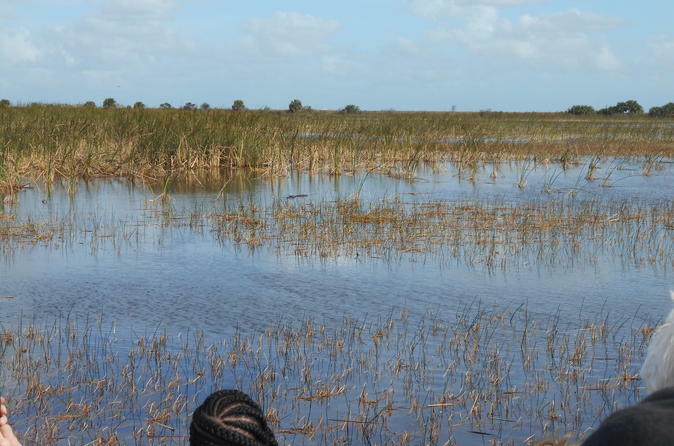 We decided in the end to take up the offer from the hotel to visit the Everglades which was inclusive of the transfers from the hotel to the Everglades and return. No Crocs or alligators when we went there. Not during winter. We learnt this on he boat! I wish they had informed us before purchasing tickets. The boat trip was very nice but we did not see anykind of animal. The Zoo was not really anything special and it was sad to see that the cages for the animals are far too small. It was a great introduction to airboating on the Everglades, for a great price. The length of the ride was perfect. Saw an alligator and an osprey in the wild. The captain, Brenda?? Canadian lady was great - informative, funny and definitely in charge. Was really frustrated about not being able to get lunch for hungry family because the only food truck was closed to cater a private event. Might want to get a backup food vendor for those times. Bob our guide was very informative on the history of the area. The airboat tour itself was OK, but there was no show that was promised, and about 80 percent of the animals in the zoo was not on display. This was so disappointing and kind of a tourist trap. Its great if youre already in the area or a local just looking to get out of your house but otherwise this is a short boat trip where the chances of seeing any wild life are slim to none.